so said ellie: Super awesome gift listings, continued. Super awesome gift listings, continued. I believe that nice things made from leather are under-appreciated. A nice thing made from leather, and well looked after, will last a long time. I am a fan of things that last a long time because I am a big believer in sentimental value, and also I have the hoarding instincts of a squirrel readying for the winter, so I think that a nice thing from leather is the way to go to head up the under-50 super awesome 5. I'm sorry if you are a vegan with ethical objections, but there is nothing lovelier than some buttery-soft leather. Also, cheese is extremely tasty, and dairy cows like making milk, it's what they do. This slim-zip case from Antonini is made in Florence from buttery-soft leather. It's just the right size to carry around some nice pens (soon to be featured in a super awesome list of things quite expensive), and it's just the right price for this list: $49.00 AUD. I'd go for the green, but that's just how I roll; it comes in lots of colours. I am a fan of perfume. I am a fan of manfume. I am also a fan of funny names for everyday objects, which imply their masculine use. For example: mandbag (my italics), mandigan (that's a cardigan for a man), and manfume (it's perfume for men, not cologne, because cologne reminds me of skeezy old men on public transport who rub up against your leg "by accident"). To that end, I love Lancome's Hypnose. I am very sad that the small bottle I had got broken, although it does seem like the perfect reason to try the new version, Senses. There was a point there when Hypnose was over-done (I feel that Gucci Flora, which is beautiful, may be the same at this point). Everyone was wearing it which made it seem a bit cliched, although that may have been related to the timing of its launch and my working in "a Large Department Store" near the cosmetics section. But in a flash of inspiration, I have found a solution, allowing its inclusion in the list.... buy the manfume! In fact, buy it here, for $42.50 AUD, and you'll get a free gift with it (and it's 30% off retail). Yesterday I watched Pride and Prejudice. The movie, not the BBC version, which frankly was a mistake; let's face it, Mathew Macfayden is cute and all, but only Colin Firth can do real justice to Mr Darcy. Anyway, here's what I think you should do to remedy this situation (ie. a serious lack of Colin Firth), if you think there's a chance it chould arise for any of your friends. Friends of mine for whom it might happen include Helen, and my mum, just in case you know me in real life and are trying to figure out where this fits in as a super awesome gift idea under 50 dollars. 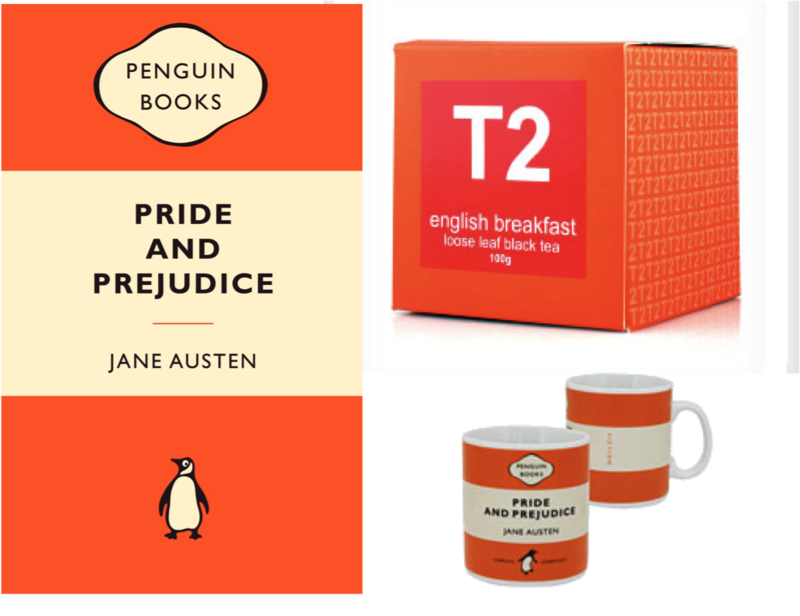 First, you should get the Penguin Pride and Prejudice mug, for $20.00 AUD. Then, you should get the actual Popular Penguin Pride and Prejudice, for $9.95 AUD. Finally, you should get some tea from T2 to go with it. Get one in an orange box, and then all three will be matchy matchy and it will look like you thought about it super hard, instead of blatantly stealing my idea. Oh, and you should probably make it Earl Grey tea, $10.95, just to be twee. By the way, there are some wonderful books in the Popular Penguin series, and it's not often that you can buy a truly good book for $9.95, so another option for this list would be to buy 5 Penguins. Or, you could just change the book/mug combination, there are many other titles available (in the mugs). Ok, so I know there is also a cute zippered pouch in this super awesome list, but I have another one for you, with slightly more utility. 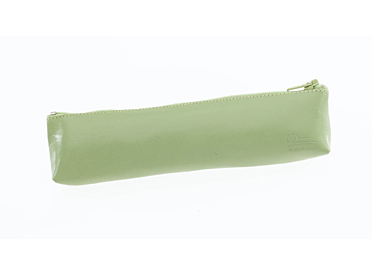 What you're going to do, is get this cute little cosmetics pouch from Witchery, for $19.95 AUD. You can choose the colour, although I'd go silver or feather, because the gold is a bit fuggers. Inside the bag, you're going to put this Clinique eyeshadow quad, $17.00 AUD. It's unboxed, but that's ok because we're going to make it look like you filled the bag with goodies, so it's not supposed to be in the box... and ok, this is going to put us 45 cents over the limit, but seriously, I have searched my heart out for you people and these items are seriously below retail, so fill the rest of the baggie up with some Benefit lip gloss, $13.50 AUD. Again, the colour is up to you, but I think you should choose Streakin' because I am juvenile, and it makes me giggle. Also, because I am good at what I do (being cheap), the quad and the gloss are from Strawberrynet, the world's number one seller of below-cost luxury cosmetics.... and as mentioned in the manfume section above, new Strawberrynet customers get some free stuffs, which you can also put in the baggie, ergo, it will look like you spent a lot more than $50.45, so give me a break about the extra 45 cents. I feel that what follows is potentially a unisex gift. I try not to discriminate, but obviously it will only work for a man who likes cooking. I've heard that they do exist. Somewhere. Having just waxed lyrical about how wonderful and cheap Popular Penguins are, I need to now make a contradictory generalist statement: sweet Jesus, books are expensive these days. But never mind, stick with me and you'll be able to make this next one work. You're going to need a cookbook, and you're going to need a pan. That is all. 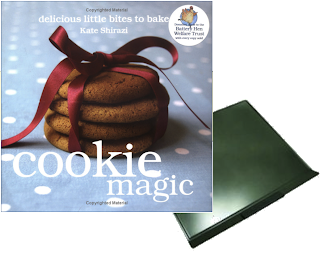 Cookie Magic, $24.95 AUD, has good reviews, and a pretty cover (I am that shallow). Pair it with an Anolon SureGrip cookie sheet, $24.95 AUD. I like Anolon pans (they're usually much more expenso, but like I said, I'm cheap and found you a good price), they're very heavy duty, and the Suregrip ones have a little silicone grip that you can touch ergonomically bare-handed to pull them out of the oven. Fancy. So there you go. I am quite pleased with myself, and we're only talking about the under 50 bracket, for people whom you quite like but aren't quite prepared to go all out for! There are some super awesome things on that list. Go forth, purchase, and wrap. And stick around, because five super awesome gifts under 100 dollars, for people whom you really like, or for some reason really really need to impress, is coming sooooooon. It involves a bundt pan, and you just can't go wrong with a bundt pan. Just a thought-how many copies of Pride and Prejudice is too many? PS Like the mug but just for looking at-it's too thick to drink tea out of.